ShukerNature: A REAL-LIFE CROCODILE-FROG FROM BORNEO? Earlier this month, I posted here on ShukerNature a series of photographs discovered by me online that portray some truly wonderful - albeit entirely fictitious - composite beasts created using Photoshop. Little did I realise at the time, however, that shortly afterwards I would be receiving some fascinating information concerning a hitherto little-publicised cryptid that closely resembles one of those computer-generated creatures but which is even more extraordinary – all of which only goes to show yet again that fact (if that is indeed what this cryptid turns out to be) is definitely far stranger than fiction. This information was contained in a book by Czech cryptozoologist Jaroslav Mareš entitled Detektivem v Říši Zvířat (‘A Detective in the Animal Kingdom’) and published in Prague in 1995, but has never previously appeared in any English-language cryptozoological account. Consequently, I am greatly indebted to Czech cryptozoological enthusiast and friend Miroslav Fišmeister for kindly bringing it to my attention and translating it for me. "I wanted to examine the claim of the Seluks from the kampong [village] which I had just left that less than one day by boat there lives a giant, 3-m-long, enormously dangerous frog with a crocodile head, on the left bank of the river [Segama River]. It was ridiculous, it was nonsense. Such a frog cannot exist, I was saying to myself. Yet I had uncertainty too. There were giant amphibians in prehistory – and who knows what lives in the deep Borneo jungles that has never been searched for? "As soon as we finished our breakfast the following day and set off, we heard the shrieks of a hornbill, which sounded terrifying in the jungle silence. The bird shrieked four times and stopped. We could not see it anywhere. "The reaction of both of the Dusuns from the kampong was immediate. We’re not going anywhere today. The sacred black bird predicts a disaster [the spectacular, black-plumed rhinoceros hornbill Buceros rhinoceros is venerated by the Dusuns]. A horrible disaster for each of us. How many of us are there? Four. And how many shrieks did we hear? "We set off in the early morning. This time the hornbills and all the other birds were silent. In a forest glade, about 400 m from our camp, we found a mummified head with the skeleton of a wild pig. To find remains of a dead animal is nothing uncommon in the jungle. But in the nasal area there were clearly-visible holes – deep and in a row, from a crocodile attack. "Yet we walked the whole day without seeing anything. It was not until we were coming back via the opposite part of that forest glade that our attention was captured by a strange sound that kept reappearing at certain intervals. At first it sounded as if someone were breaking tree branches there, but the mysterious sound was much deeper. It was more like stone crushing than tree breaking. And then I saw it. On the edge of bushes there stood – its back turned towards us – possibly the strangest animal I have ever seen. It had no tail, its body covered with brown scales with black spots ended in an arc right behind strong, muscled hind legs. The scales, placed evenly over the back of the animal and forming a symmetrical black pattern, were proof that the creature never had a tail. The hind legs – at that moment we could not see the front ones – were very bulky and relatively long. They were raised high and the whole body was bent forward markedly. The body was paunchy, flabby, and gave us the impression of cumbersomeness and lethargy. It was clear that the animal was just consuming its prey. At that moment we could not see anything more; both the animal’s position and the thick brushwood on the edge of the bushes prevented us from seeing more. Only the cracking of the crunched meat and the crushing of the bones proved that the mouth of the mysterious creature must be horrible. "My guides were shaking with horror. They did not expect to see their giant frog so unexpectedly and from such a short distance. But it was evidently no frog. I was determined that I must see the head. "I walked through the plants to the side. But the thick vegetation covered its secret perfectly. Then I saw part of the dorsum and shortly afterwards almost the whole animal. Only the head was covered by the prey – again a wild pig. The life of a Bearded Pig is not easy here, I thought. 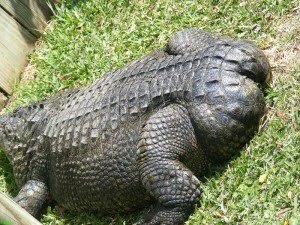 "The surface of the body resembled a crocodile. Suddenly the animal rose on its front legs as well. A giant crocodile head appeared. The mysterious animal was huge with paunchy sides and nearly two metres long. For a while it towered above the vegetation like a stone statue, but then it started to move towards me. "I did not wait for more. I started to retreat towards my guides who already had a good head start. The camp was topsy-turvy and disarrayed. Would it chase us all the way to there? "At first I thought that we had encountered a new, as yet undiscovered species of land-living, tailless crocodile. In prehistory, there existed several dangerous land-living crocodiles with long legs, but they all had a tail. 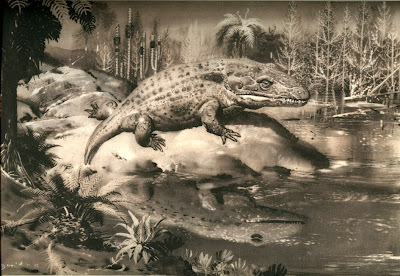 A tailless crocodile is completely unknown even among palaeontologists. The following day, I wanted to go there again, but my guides considered this idea pure madness. They thoroughly prepared everything for sailing away in the morning and I faced a choice: if I wanted to stay, I naturally could, but on my own. Furthermore, the hornbill shrieked again. And so we sailed on early in the morning. "The more I thought about it, the more I came to the conclusion that a tailless crocodile is really a strange thing. Yet I absolutely ruled out the possibility that this was a crocodile that once had a tail and lost it in a fight with another crocodile. 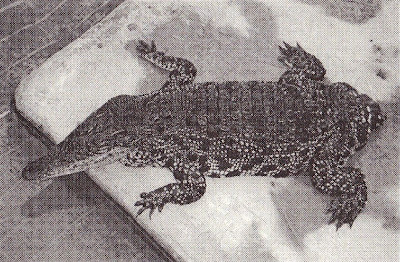 Giant specimens of saltwater crocodiles – including one notorious maneater - whose tails were partly missing have been shot. But as I have already mentioned, in this case it was evident straight away that this animal could never have had any tail. And to be honest, I thought that the hind legs were too large and strong for a crocodile. I did not see the front legs properly. Later, when I conversed about several problems concerning crocodiles in Australia with Graham Webb, a noted specialist, I was told that among baby crocodiles hatched in one nest there can be several ones that lack a tail. The reasons are either genetic or perhaps there is too high a temperature during incubation. 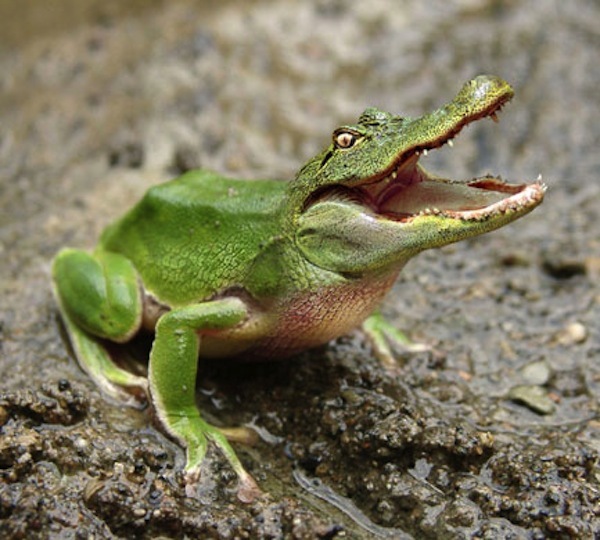 Could the mysterious “Crocodile frog” be one of these babies that overcame its handicap due to other extraordinary qualities and its strength and survived, specialising in hunting on the ground where the prey was easier for it to catch? Did it grow to maturity and attack the pigs in the same way that its tailed brothers do from the water, by gripping their mouths, while hiding on the forest clearances? It sounds fantastic, but still more realistic than to consider the tailless monster to be a new, as yet unknown species. It will never stop haunting me anyway." It may be sheer coincidence, but the famously tailless Manx cats are also known for their unusually well-developed hind legs. Could there be a rare homologous mutant gene in crocodiles whose expression results in this same linked phenotypic effect? "The north Borneo river Segama looks like a normal jungle river. But unlike the rest, her stream is inhabited by mysterious creatures that cannot be seen anywhere else in the world. I was told about them during my one-week voyage by an 80-year-old Kadazan [=Dusun] fisherman, Bateig Labi. This patriarch of the Bugit Balachon kampong does not tell tall tales. People around him respect him deeply and greatly value his advice and experience. "He saw the roughly 3-m-long monster called appropriately the “Crocodile frog” by the local Kadazans several times in the jungles around Segama. He said that it had a giant crocodile head and a large slimy body of an amphibian. The scary creature gave Bateig a look with its bulging eyes and then disappeared in the impenetrable undergrowth with a big noise. 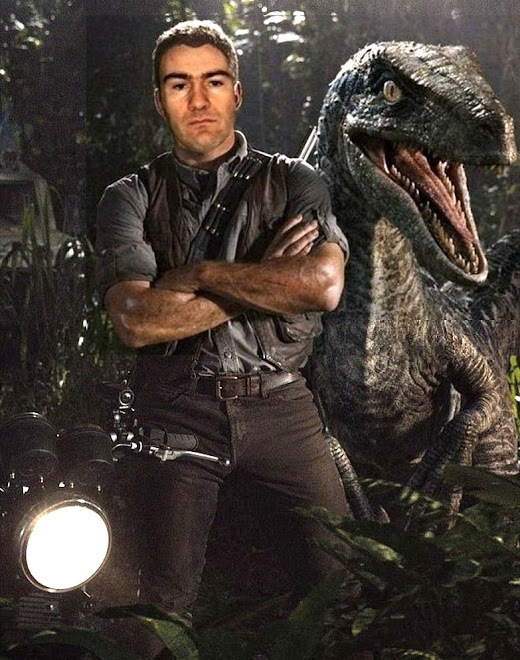 "In this situation I can think of two hypotheses – the first, albeit very improbable, would be the survival of the large amphibians well known among palaeontologists. For example the species of the Mastodonsaurus genus, which looked like monstrous frogs, were more than 4 m long and they were feared predators. As we know from fossils, the skulls themselves were longer than 1 m! Yet their survival is highly improbable due to their known general sensitivity to any changes of habitat. 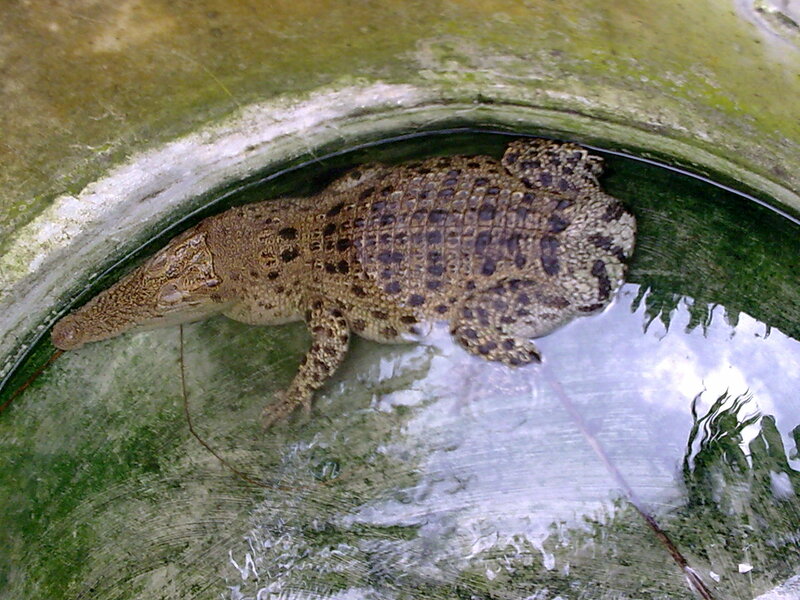 "I thought of another hypothesis while visiting a crocodile farm near the north Borneo town of Sandakan. In the concrete tanks there also live – next to fully grown 5-m-long specimens – deformed crocodiles that lack a tail and whose crippled bodies with which they were born really look a bit like frogs. "Is it possible that the legends of the mysterious frog phantom are based on the observing of these tailless specimens, which by a miracle overcame their handicap and specialised in hunting the land animals rather than fish? That is a possible solution to the Segama mystery too. "Yet the idea of surviving mastodonsaurs that still hunt in the jungles of today is undoubtedly more inviting." In his book, Sláma included the following photograph of one of the tailless crocodiles that he encountered at the Sandakan crocodile farm, and there is little doubt that a freak specimen of this nature might well indeed have inspired native legends of giant ‘crocodile frogs’ in the jungles fringing the river Segama. Of course, just like Sláma, I’d be delighted for there to be an undiscovered modern-day species of mastodonsaur out there, but just the knowledge that a creature I’d hitherto discounted as an entirely fictitious Photoshop creation actually has a cryptozoological precedent is delight, and discovery, enough...at least for now! "You can see a photo of an articulated and nearly complete skeleton, a new life-sized reconstruction (sadly it´s not easy to see the whole body) as well as an old outdated model, which looks very similar to the description of the croc-frog. All photos are from the "Museum am Löwentor" at Stuttgart, one of the largest paleontology museums of the world. Most of the fossils there, including giant amphibians like Mastodonsaurus, were found in the region around Stuttgart. The only photo which is not from Stuttgart, is that which shows the bony armour plate of Mastodonsaurus, it´s from the great Museum of Natural history at Vienna. Mastodonsaurus was really an extremely large animal, some isolated fossils indicate specimens of at least 6 or probably even 7 m."
The coincidental similarity with a Photoshop critter is quite surprising. The tailless croc certainly shows how these legends could have originated. Thank you! The epithet 'friend' makes me feel very happy and honoured. P. S.: after publishing a link to this article on my blog, a friend told me that the Photoshop picture was created by my compatriot, a man whom I know for years. What a lovely coincidence! I asked and he says that it is one of his pictures, some 6 or 7 years old, although for some reason it lacks his signature. He does not mind at all that they're circulating the world, by the way. You can see the old source here: http://ateo.cz/f/storage/crocofrog.jpg He says that it really is a funny coincidence, because he usually turns the picture to avoid collision with copyright, yet this was turned again - that is, the animal looks to the right again.